Year of the Cat: the unashamedly bias take on the 2016 AFL season. He was everywhere. 23 disposals, 7 marks, two goals and….he was in the wrong bloody jumper. Well played Stevie J – but I hated every minute of it. I’m just glad he didn’t land the killer blow in those final minutes, because that would have sucked. So we’ve lost in round 2. Bugger. The Giants’ young guns were too slick and fast for our tall line-up. Luckily, Chris Scott has until Round 13 to address our lack of pace until we get royally smashed by a side that WILL run rings around us – the Western Bulldogs. If I took anything out of today, it’s that Geelong need to be more mobile on the deck because the Doggies are scary good right now. Cats, beware the Dogs. What also needs addressing is the negativity on Geelong’s fan pages. Apparently after today the club is ridding itself of Chris Scott and Shane Kersten is to be confined to the scrap heap. Settle down, folks. 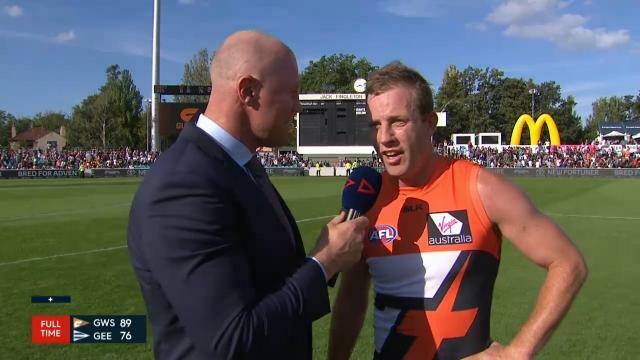 The Giants aren’t a bad side (they have Stevie J, remember!) and it’s not like our boys were embarrassed. It was the usual formula, actually. A costly fade-out (how Cats fans have come to love those) followed by a gutsy rally. In the end, they just ran out of steam. Blame the six day break. That will do. On the plus side, Hawkins probably fluked goal of the year with his 55 metre soccer from the ground. That will be replayed for long after the memories of our 13 point loss. We also have the Lions and then Essendon over the next two weeks. The Cats should be (should be) 3-1 before their next interstate trip to Adelaide against the Power – who have not set the world on fire thus far. So, chin up and move on, and if you have a spare $10, a sneaky punt on the Giants at $51 for the flag is not the dumbest idea. Mind you, Geelong at $6.50 is looking good too. What’s not looking good is most punters’ Supercoach sides this week. Danger scored only 74, Goldstein a miserable 90, and Priddis a miserable 78. They were my premiums anyway. Not happy. Yet I’m not the only one. How about those trigger fingers who traded out Fyfe after one week? Or how would you be if you were a Melbourne or Richmond fan this week? For a moment it looked like Melbourne wouldn’t be the ongoing joke of the league, but then they went and lost to Essendon just to remind us that they’re Melbourne. As for Richmond, one must have a certain admiration for their legions of fans who put up with that sort of disappointment. It takes a special sort of effort to blow a 17 point lead 23 minutes into the final quarter, but Tyrone Vickery and Alex Rance ensured that defeat was never out of the Tigers’ reach. Well done, fellas. Meanwhile, Port Adelaide’s record as a one year wonder is looking more likely, while Ross Lyon’s search for a premiership is looking as likely as a Billie Smedts Brownlow right now. However, it’s only Round 2, and it’s a very long season. My tips are already stuffed, my fiance remembers why she hates Fox Footy, and my mates have already given me the shits about Geelong losing. Ah, footy season, it’s good to have you back. The fan pages this week are as polar opposite and as bad as they were last week…. Love passion but seriously folks RELAX!